US President Donald Trump has threatened to deploy the military and close the country's southern border if Mexico does not stop a caravan of migrants heading north. Some have said they are fleeing violence and poverty in Honduras, where human rights activists have complained of constant human rights violations. A number say they hope to reach the United States, where it’s thought they could reach the border in the next few weeks. President Trump – who earlier had threatened to stop aid to Central American countries – has warned Mexico in a tweet to “stop this onslaught”, or he would call up the US military and close the border. US Secretary of State Mike Pompeo is due in Mexico City on Friday. Trump has since thanked Mexico which has moved to step up security at its border with Guatemala. However, although President-elect Andres Manuel Lopez Obrador has said he is confident that agreement with the US can be reached, the Mexican government has denied that a deal has been done. Mexico says people arriving at the border will be able to apply for refugee status, and has asked for help from the UN refugee agency. The migrant caravan is heading north as the US mid-term elections approach, and Donald Trump lost no opportunity to comment as he addressed a rally of supporters in Montana. The president attacked US Democrats – accusing them of encouraging illegal migration – as well as Central American leaders and the migrants themselves, referring in a tweet to “criminal elements and drugs pouring in”. One Honduran human rights group said the migration was more a case of “forced displacement” than voluntary emigration, although the Honduran government has warned people not to join an “irregular movement” it describes as “political”. 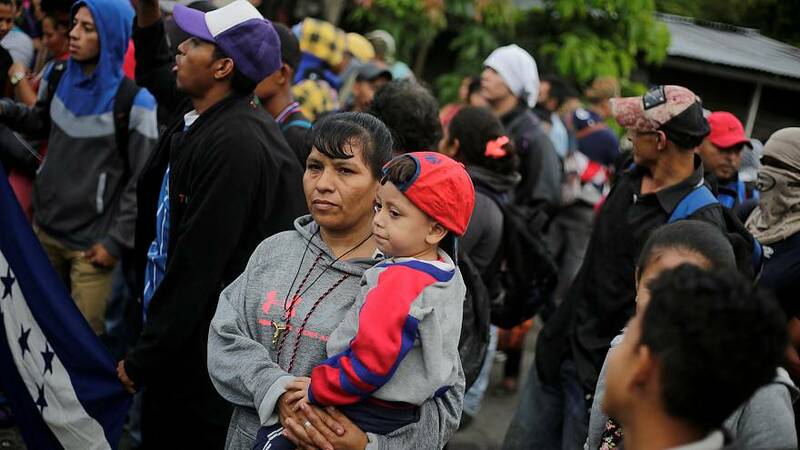 Hondurans have the right to free movement in some Central American countries, although there have been reports of migrants being blocked at the Guatemalan border. Despite Trump’s familiar fiery rhetoric, there are reports that the migration issue prompted a furious row between senior Trump advisers – National Security Adviser John Bolton and Chief of Staff John Kelly – in the White House. Donald Trump was elected after promising to get tough on immigration and build a wall along the border with Mexico. However, the US Congress has refused to fund it in full. The US-Mexican border is one of the busiest in the world, with thousands of commuters and trade worth millions of dollars passing through each day. Central American governments have dismissed Trump’s threats to block US aid. Honduran activists have said they would welcome such a move, as most is channelled to security forces who are accused of repression. They blame the Trump administration for backing the Honduran government, and accuse the US president of scapegoating migrants and refugees. Trump ramps up anti-immigration rhetoric as 'caravan' heads for U.S.